Cope Brothers operated the largest tobacco factory in Britain, and pioneered the employment of women in the sector. 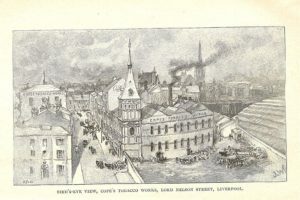 George Cope (1823 – 1888) and Thomas Cope (1827 – 1884) began to sell cigars, snuff and tobacco from 63 Paradise Street, Liverpool in 1848. Trading as Cope Brothers, the firm was undertaking its own manufacturing from premises on Lord Nelson Street by 1853. George Cope managed the manufacturing arm of the firm, while Thomas Cope was responsible for the business as a whole. Cope Brothers was one of the first tobacco manufacturers in Britain to employ a female workforce. Cope Brothers began to employ women following a factory strike in 1858. Female workers proved capable, so the policy was continued until the factory employed around 700 women and girls by 1871, out of a total of 774 employees. 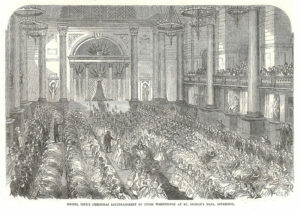 Cope’s Christmas entertainment at St George’s Hall in 1864. Taken from the Illustrated London News. 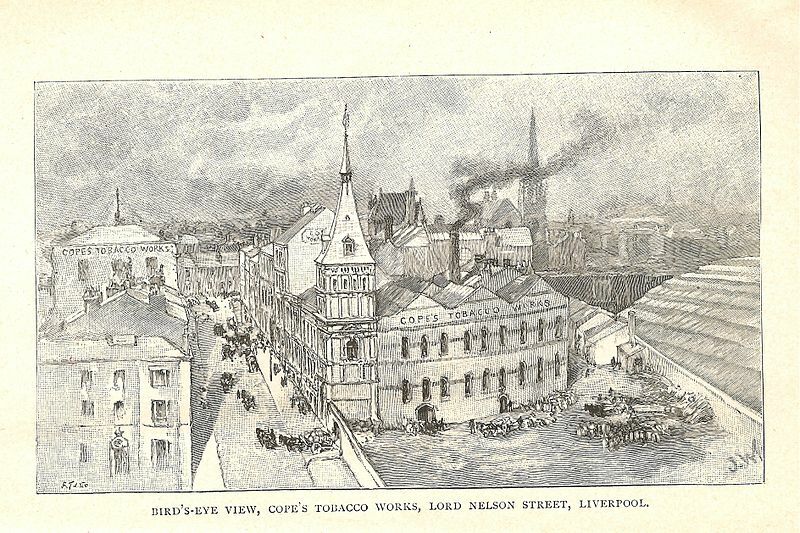 Cope Brothers operated the largest tobacco factory in Britain by 1870. The factory was spacious and well-ventilated. Charles Dickens and Emily Faithfull were given tours and reported favourably. Shifts were of six to eight hours in duration. The girls were generally the daughters of shopkeepers, warehousemen and clerks. Cope Brothers employed 1,400 women and girls by 1879. Cope Brothers operated the largest tobacco factory in the world in 1884. The buildings occupied almost the entirety of one side of Lord Nelson Street. Cope Brothers was the largest manufacturer of cigarettes in England, with a production rate of 250,000 to 300,000 a week. Thomas Cope died in 1884, and left an estate valued at £199,000. Cope Brothers was converted into a private limited liability company with a capital of £350,000 in 1885. John A Willox (1842 – 1905) was appointed as a director. George Cope died in 1888. He was succeeded as managing director by his nephew, Thomas Henry Cope (1867 – 1913). By 1892 the regular workforce at the Liverpool factory totalled 1,500 people, many of them women and girls. With four percent of the British tobacco market, Cope Brothers was second only to Wills of Bristol. The American Tobacco Company (ATC) acquired Ogdens, a Liverpool tobacco manufacturer, in 1901. ATC operated Ogdens at a massive loss in order to undercut its rivals and increase its market share. Although the acquisition was to impact the entire British tobacco industry, Cope Brothers suffered more that most, perhaps due to its proximity to its rival, as well as its decision not to join Imperial Tobacco, formed as a defensive merger of major British tobacco companies. John A Willox, chairman of Cope Brothers, decried “the deliberate and organised effort on the part of American capitalists to destroy a British industry and create a selfish monopoly for themselves”. On the other hand, the Daily Mail criticised Cope Brothers as “slow, easy-going [and] old-fashioned”, with “out-of-date methods”. In a defensive move, Cope Brothers acquired Richard Lloyd, tobacco manufacturers best known for the Old Holborn brand, in 1902. Robinson & Barnsdale Ltd, tobacco manufacturers of Nottingham, was acquired in 1905. Escudo Navy De Luxe pipe tobacco was introduced by Cope Brothers in 1912. H C Lloyd & Son Ltd of Exeter was acquired in 1924. Around 460 Cope Brothers employees went on strike in 1950 in protest against the hiring of non-unionised labour. The strike lasted for nearly three months, and resulted in the dismissal of nearly 200 striking workers. Cope Brothers was acquired by Gallaher in 1952, in an exchange of shares which valued the company at around £1 million. At the time, purchase of American tobacco was rationed with quotas issued by the British Government, and Gallaher acquired Cope Brothers to increase its quota allowance. Gallaher was also attracted by the strength of the Old Holborn brand. The Lord Nelson Street factory was closed down in 1952, and the site was sold to the Automatic Telephone and Electric Company. Cope Brothers remained a major Gallaher subsidiary as late as 1969. Escudo Navy De Luxe pipe tobacco and Old Holborn are still sold as of 2017.